This week's posts are dedicated to making the hectic transition into fall. For those of us who are teachers, or have kids, this marks the beginning of the academic year with all the running around and organization that requires. So my mantra right now is: keep things simple, keep things light. I covered simple on Monday. Today I turn to something light. In the wine department, nothing says "light" to me like a bright refreshing Riesling. 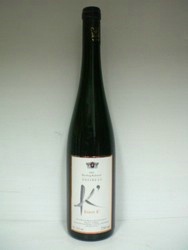 The 2009 Weingut Baron Knyphausen Riesling Kabinett Baron K' (available for $13-$18) is epitomizes the light, enjoyable charms of the grape. This is not a dry wine, but instead has a decidedly sweet edge to the flavors, with rich peach and apple notes. When you take a sniff, you may get a whiff of honey and when you sip it a bit of stoniness flirts with all those rich orchard fruits. Good QPR. This wine is ideal for pairing with spicy foods--the spicier the better!--which can be a real treat in these late summer days. We paired the wine with an absolutely delicious plate of shrimp that had been soaking in a coconut-lemongrass marinade for four hours and then popped on the grill. The marinade's rich coconut and spicy Fresno pepper flavors were a perfect counterpoint to the wine's sweetness, while the lemongrass and lime juice added some welcome acidity to the wine's flavors. (This marinade would be terrific on firm, white fish like halibut, too). the shrimp and marinade sound delic..do you have a recipe for that? Yep! just click on the words "coconut-lemongrass marinade" and it will take you to the recipe.